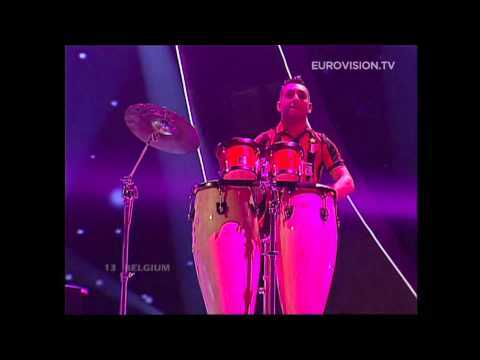 Belgium has participated since the first Eurovision Song Contest 1956 in Lugano, Switzerland. Before everybody was allowed to sing in English, Belgium's entries were sung one year in Flemish and the following year in French always in alternating order. This was probably the reason for a lot of variation in Belgian entries from classical chansons like "Laissez Briller Le Soleil" by Reynart (Dublin 1988), more extravagant songs like "Rendezvous" by a band called Pas De Deux (Munich 1983) or proper pop songs like "Geef het op" by Clouseau (Rome 1991). In recent years songs from Belgium were less international and ended up in the lower middle-field on the scoreboard. Last year this suddenly changed when the country participated with a folk song called "Sanomi" (for which they invented a language) sung by Urban Trad. They became 2nd in Riga and for that reason qualified directly for the grand final on Saturday. This years Belgian entry has already been named one of the favourites. Xandee will represent her country in Istanbul with a very catchy song that includes a lot of dance and drum solos. It will be interesting to see how the song will be performed live on stage - we all know this has become more and more important at the Eurovision over the years. The song is called "1 life", is sung in English and was written by the same composers, Dirk and Mark Paelinck, who were responsible for Sergio's song in Tallinn 2002, which unfortunately didn't do very well that year. The attractive, 25 year old singer Xandee, who's real name is Sandy Boets, has become popular as part of a duo called "Touch Of Joy".